Heat a large grill pan over medium-high heat. Sprinkle chicken with salt and pepper. Coat pan with cooking spray. Place chicken in pan; cook 6 minutes on each side or until done. 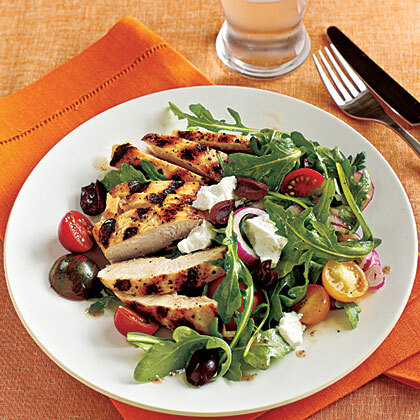 While chicken cooks, combine arugula, tomatoes, onion, 3 tablespoons dressing, and olives; toss gently. Arrange about 1 cup salad on each of 4 plates; top each with 2 tablespoons cheese. Brush chicken with remaining 1 tablespoon dressing. Cut chicken into slices. Arrange 1 sliced chicken breast half on each salad.